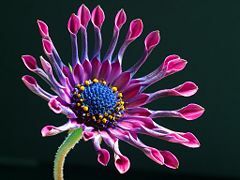 This Osteospermum 'Pink Whirls' is a successful cultivar. In horticulture, cultivar refers to a group of plants of the same species that have been selected, maintained through cultivation, and given a unique name because of desirable characteristics (decorative or useful) that distinguish this assemblage from otherwise similar plants. When propagated, asexually or sexually, the plants retain those characteristics. For example, there is one species of tomato, Solanum lycopersicum, but thousands of tomato cultivars that have been selected with varying fruit types, and for optimum growth in differing growing conditions. There are numerous cultivars of watermelon, Citrullus lanatus, which can differ in shape, rind color, fruit size, type of seed, and color of flesh. Horticulturalists have developed more than 100,000 hybrids and cultivars of orchids alone, as well as innumerable cultivars of other species, for such purposes as beauty, flavor, size, disease and insect resistance, seedlessness, and so forth. Article 2.1 of the International Code of Nomenclature for Cultivated Plants (the ICNCP, commonly known as the "Cultivated Plant Code") states that a cultivar is the "primary category of cultivated plants whose nomenclature is governed by this Code." It defines a cultivar as "an assemblage of plants that has been selected for a particular attribute or combination of attributes, and that is clearly distinct, uniform, and stable in its characteristics and that, when propagated by appropriate means, retains those characteristics" (Art. 2.2). 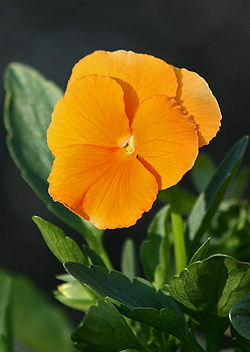 The naming of a cultivar should conform to the ICNCP. For this, it must be distinct from other cultivars and it must be possible to propagate it reliably, in the manner prescribed for that particular cultivar. The status of a cultivar is quite limited, with nomenclatural consequences only; it offers no legal protection. 3 Trade designations and "selling names"
The word cultivar was coined by Liberty Hyde Bailey from "cultivated" and "variety," but is not interchangeable with the botanical rank of variety, nor with the legal term "plant variety" (DHLA). The concept of cultivar is driven by pragmatism and serves the practical needs of horticulture, agriculture, forestry, and so forth. The plant chosen as a cultivar may have been bred deliberately, selected from plants in cultivation, or discovered in the wild. It is maintained in cultivation by asexual propagation or it may be seed-raised from inbreeding within the cultivar. Clones produced by vegetative (asexual) propagation are genetically identical and will appear so when grown under the same conditions. Seed-raised cultivars can be mixes that show a wide variation in one or more traits, such as a mix of flower colors, or may be highly homogeneous plant strains produced by heavily selecting out undesirable traits, thus producing a breeding line that is uniform. Cultivars can be F1 hybrids produced by cross breeding, and there are a few F2 hybrid seed cultivars too (Achillea 'Summer Berries'). There is not necessarily a relationship between any cultivar and any particular genome. The ICNCP emphasizes that different cultivated plants may be accepted as different cultivars, even if they have the same genome, while cultivated plants with different genomes may be a single cultivar. Although artificial selection is part of the definition of a cultivar, in some cultivars, the human involvement was limited to making a selection among plants growing in the wild—whether by collecting growing tissue to propagate from, or by gathering seed. Other cultivars are strictly artificial: the plants must be made anew every time, as in the case of an F1 hybrid between two plant lines. It is not required that a cultivar can reproduce itself. The "appropriate means of propagation" vary from cultivar to cultivar. This may range from propagation by seed that was the result of natural pollination to laboratory propagation. Many cultivars are clones and are propagated by cuttings, grafting, and so forth. Seedless grapes cultivars, lacking seeds, are vegetatively propagated by cuttings. Cultivars include many garden and food crops: "Granny Smith" and "red delicious" are cultivars of apples propagated by cuttings or grafting; "red sails" and "Great Lakes" are lettuce cultivars propagated by seeds. Hosta and Hemerocallis plants are cultivars produced by micro propagation or division. Cultivars are identified by uniquely distinguishing names. Names of cultivars are regulated by the International Code of Nomenclature for Cultivated Plants (ICNCP), are registered with an International Cultivar Registration Authority (ICRA), and conform to the rules of the International Society for Horticultural Science Commission for Nomenclature and Cultivar Registration (ISHS). There are separate registration authorities for different plant groups. In addition, cultivars may get a trademark name, protected by law (see Trade Designations and "Selling Names," below). A cultivar name consists of a botanical name (of a genus, species, infraspecific taxon, interspecific hybrid, or intergeneric hybrid) followed by a cultivar epithet. The cultivar epithet is capitalized and put between single quotes: preferably it should not be italicized. Cultivar epithets published before January 1, 1959, were often given a Latin form and can be readily confused with the specific epithets in botanical names. After that date, newly coined cultivar epithets must be in a modern vernacular language to distinguish them from botanical epithets. Where several very similar cultivars exist, these are termed Cultivar Groups. The name is in normal type and capitalized as in a single cultivar, but not in single quotes, and followed by "Group" (or its equivalent in other languages). Trade designations and "selling names"
Cultivars that are still being developed and not yet ready for release to retail sale are often coded with letters and/or numbers before being assigned a name. It is common for this code name to be quoted alongside the new cultivar name or trade designation when the plant is made available commercially (for example Rosa Fascination = 'Poulmax'). This may continue, in books or magazines and on plant labels, for several years after the plant was released. Because a name that is attractive in one language may have less appeal in another country, a plant may be given different selling names from country to country. Quoting the code allows the correct identification of cultivars around the world and helps to avoid the once-common situation where the same plant might, confusingly, be sold under several different names in one country, having been imported under different aliases. Another form of what the Cultivated Plant Code (ICNCP) calls a trade designation is the plant "variety", as defined in the UPOV Convention. This is not to be confused with the botanical rank of variety. Some cultivars are "naturalized" in gardening; in other words they are planted out and largely left to their own devices. With pollination and regrowth from seed, true natural processes, the distinct cultivars will disappear over time. The cultivar's genetic material, however, may become part of the gene pool of a population, where it will be largely but not completely swamped. Cultivars that are propagated by asexual means such as dividing, cuttings, or micropropagation generally do not come true from seed. Plants raised from seed saved from these plants should never be called by the cultivar name. Seeds collected from seed-raised cultivars may or may not yield the true cultivar. Cross pollination with other plants in the garden or from the surrounding area could occur that could contaminate the seed line and produce different plants the next generation. Even if a seed raised cultivar is grown in isolation, often the cultivar can change as different combinations of recessive genes are expressed. Thus, good breeders maintain the seed lines by weeding out atypical plants before they can pass on their genes or pathogens to the next generation and affect the cultivar line (Mosley et al. 1999). The practice of patent protection (legally protecting something new) is an important tool to encourage the development of new useful cultivars. This practice is considered unethical by some people. Others, however, consider "protected cultivars" to be ethical based on their being the result of deliberate breeding programs and selection activity by nurseries or plant breeders and often the result of years of work. "Plant patents" and "plant breeder's rights" (which can be expensive to obtain) are means for the breeder or inventor to obtain financial reward for developing a new cultivar (Gepts 2004). With plants produced by genetic engineering becoming more widely used, the companies producing cultivars by either genetic engineering or traditional means often claim a patent on their product. Plants so controlled retain certain rights that accrue not to the grower, but to the firm or agency that engineered the cultivar. Some plants are often labeled "PBR," which stands for "plant breeders' rights," or "PVR," which stands for "plant variety rights." It is illegal in countries that obey international law to harvest seeds from a patented "variety" except for personal use. Other means of legal protection include the use of trademarked names, whereby the name the plant is sold under is trademarked, but the plant itself is not protected. Trademarking a name is inexpensive and requires less work, while patents can take a few years to be granted and have a greater expense. Some previously named cultivars have been renamed and sold under trademarked names. In horticulture, plants that are patented or trademarked are often licensed to large wholesalers that multiply and distribute the plants to retail sellers. The wholesalers pay a fee to the patent or trade mark holders for each plant sold; those plants that are patented are labeled with "It's unlawful to propagate this plant" or a similar phrase. Typically, the license agreement specifies that a plant must be sold with a tag thus marked to help ensure that unlawfully produced plants are not sold. Department of Horticulture and Landscape Architecture (DHLA). n.d. Plant nomenclature: Cultivar Department of Horticulture and Landscape Architecture, Purdue University. Retrieved April 20, 2008. Gepts, P. 2004. Who owns biodiversity, and how should the owners be compensated? Plant Physiology 134: 1295-1307. Lord, T. 2008. Not what they seem The Royal Horticultural Society. Retrieved April 20, 2008. Mosley, A., O. Gutbrod, and J. McMorran. 1999. Roguing seed potatoes Oregon State University. Retrieved April 20, 2008. This page was last modified on 24 November 2017, at 20:35.